College or high school kids on a camping trip are killed by a psycho killer lurking in the woods is the tagline typically used for many slasher films. THE HORDE has a similar theme, however there is SO MUCH more going on! 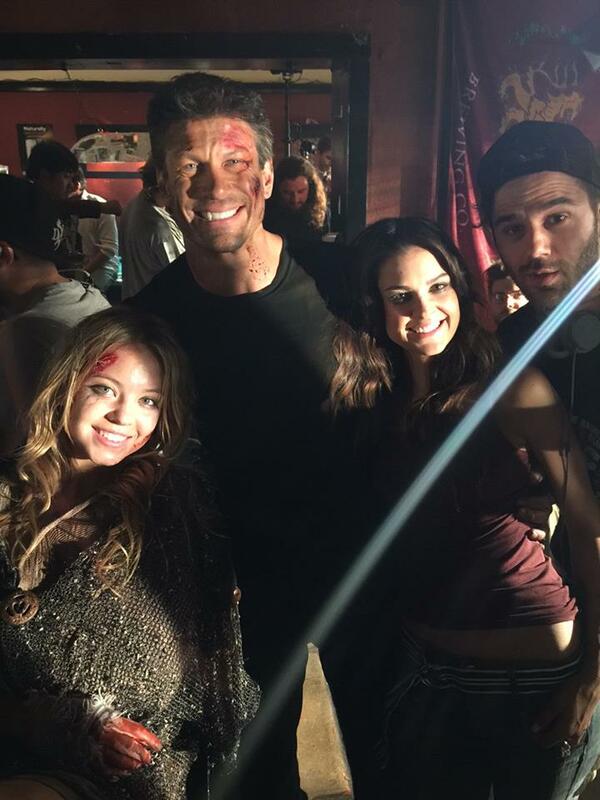 The movie is packed with action, horror, martial arts, a terrifying breed of mutants, and it contains a love story. John Crenshaw accompanies his girlfriend and her students on a weekend nature-photography expedition deep into the woods. What should be an educational and fun-filled weekend turns into horror as the group is besieged by an unspeakable evil – a horde of hideously disfigured, mutated humans with an insatiable taste for blood. As things go from bad to worse, Crenshaw becomes their only hope if they are going to get out alive. The film introduces Crenshaw (Paul Logan) while he’s rehearsing to himself how to propose to his girlfriend Selina. You can tell Crenshaw’s a caring man, but yet a total badass. In addition to Logan’s flawless action scenes, he was very convincing as Selina’s (Tiffany Brouwer) caring and loving boyfriend. When his plan to propose needs to change due to Selina’s photography camping trip that was moved up a week, he makes the necessary adjustments. Once he’s with the group and in the woods, you can tell Crenshaw actually is enjoying the trip and the company of Selina and her students. Even the annoying and snobby Riley (Thomas Ochoa)) who occasionally insults Crenshaw at times, but Crenshaw dealt with so much worse in the military that he can mostly handle the criticism. During a pit stop in a bar the group encounters some local trouble. Here we learn that Crenshaw tries to avoid conflict as much as possible knowing he’ll do serious damage to the instigators, but when he senses a real threat he’ll jump into action. When the group makes it to the campsite, the story then has all the important elements adequately set up. The audience knows the conflict, plot, subplot, and characters all within the first ten minutes. When the kids and Selina are attacked and kidnapped by the mutants, Crenshaw’s military expertise comes out and saving everyone is more personal than any of his dangerous military missions. The things the mutants do to the girls will have you trying to reach through the screen and brutalize the mutants yourself. They make you sick to your stomach and have you wanting Crenshaw to do his worst to them. 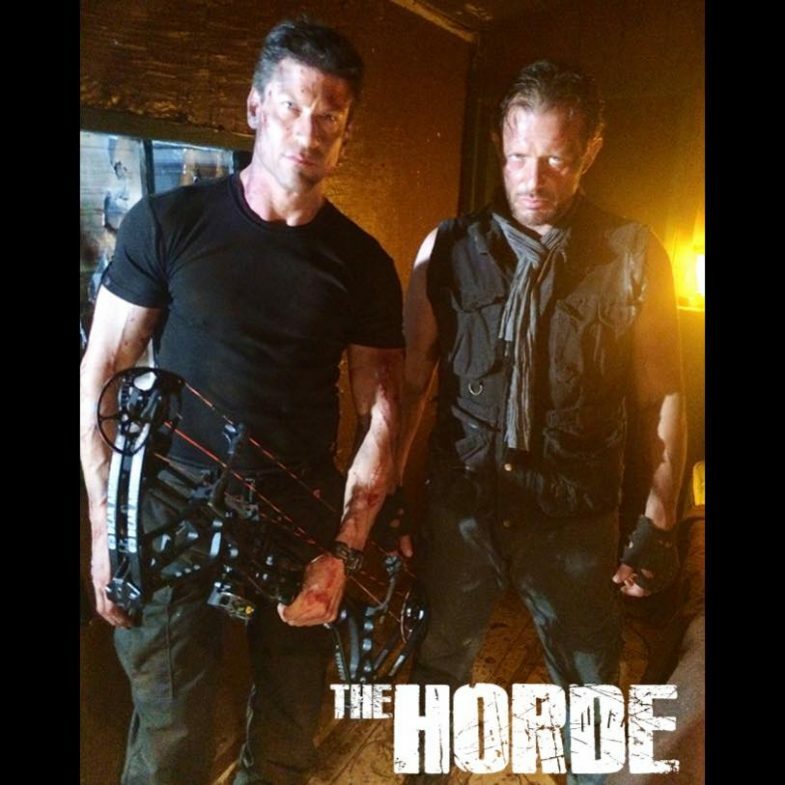 From the first attack on the camp to the very final moment, THE HORDE is nonstop action and chilling scenes that will have you yearning for more. It goes beyond action and horror and keeps you engrossed with all the details that keep moving the story forward. Once the movie is over you’ll need eye drops to get the red out from not blinking for 87 minutes. With a solid script, the director would have his work cut out for him and that’s exactly why Logan brought on Director Jared Cohn and Cinematographer Laura Beth Love. Two of the best in the industry that can create blockbuster results on a low budget. Most of the film occurs at nighttime and Laura Beth Love with her professional and creative skills was able to provide the ideal setting and lighting to create a terrifying mood. Cohn’s camera directions will have you on the edge of your seat making you feel like you’re in the scene with the all the action. All that is complimented by the eerie music provided by composer Michael John Mollo. With a cast of established, highly regarded actors and some new faces, they all obviously put everything into their respectable roles as each and every actor put on a topnotch performance. 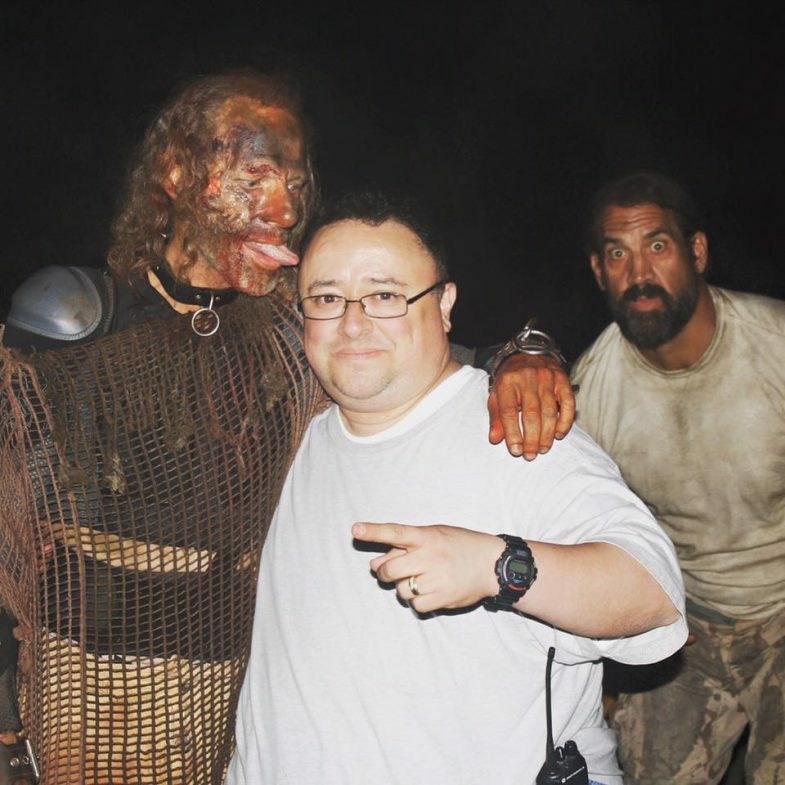 One item to note is that Paul Logan did all his own stunts and his intent was to provide realistic, brutal, hard-nosed bone shattering fight scenes, which he accomplished with flying colors….and flying limbs in some occasions. 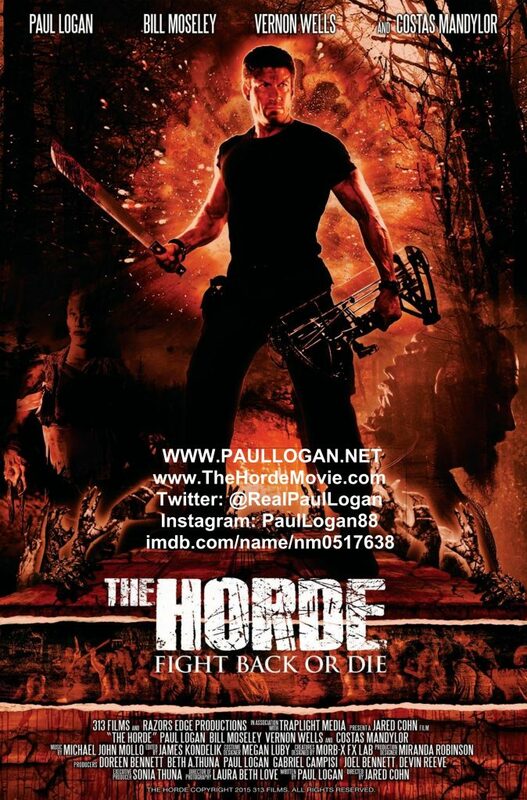 THE HORDE is a must see and is available May 6thon iTunes and other transactional sites such as Direct TV On Demand, Dish Network, Amazon Instant Video, Playstation Network, Microsoft, YouTube Movies, Google Play, Vudu, Verizon Fios, Cox, Charter on Demand and other transactional video on demand sites throughout the U.S. and Canada. 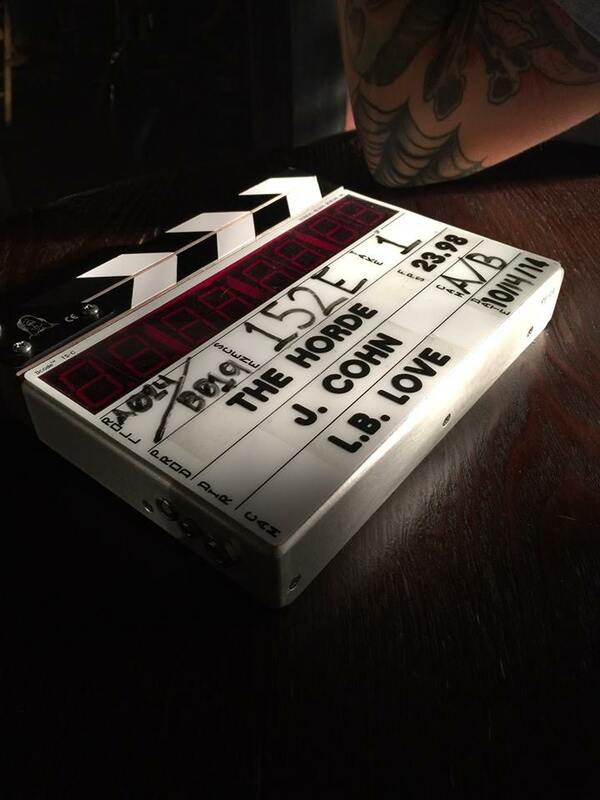 Please go to www.thehordemovie.com for a complete list of platforms and where it will be shown worldwide.